Extend your Current RMS system using our integrations. 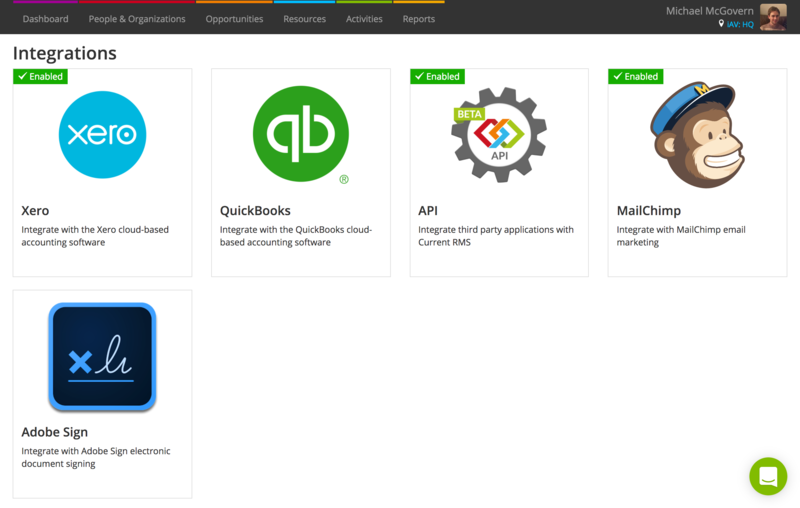 Plus, we have an open API that you may use to develop your own integrations! You don’t need to integrate with any services to use Current RMS – all of our integrations are optional and extend the functionality in Current. It’s worth thinking about integrations during setup as it may impact the way you enter data into your system. You might also like to trial some of the services we integrate with alongside your trial of Current. Organizations created in Current RMS can automatically create new linked contacts in either Xero or QuickBooks Online (QBO). Changes to linked organizations can automatically update the linked contact in Xero or QBO. Use the Post invoice action to post invoices straight to Xero or QBO. Current RMS displays some information about the invoice from Xero or QBO when you view a posted invoice. If you know that you’re planning to use Current RMS with Xero or QuickBooks Online and you’re new to both systems, we recommend setting up your integration and toggling the “Create a linked contact when creating an organization” slider to YES. This means that any organizations you create in Current RMS via the web interface will automatically be created in Xero or QuickBooks Online – no need to re-import at a later point. If you already have a Xero or QuickBooks Online system, you can import all of your contacts from that system to Current RMS as organizations when you set up your integration. Head to System Setup > Integrations to turn on and configure integrations.